Part of Hamilton Parish's crest, from that of the 2nd Marquis of Hamilton. His coat of arms, copyrighted by his family, members of which still exist today, is exactly what is shown on Bermuda's Hamilton Parish crest. Used with exclusive permission from the copyright owners. Do not copy. Book: Bermuda's Architectural Heritage: Hamilton Parish. Diana Chudleigh. 2002, Bermuda National Trust. 4th in its historic buildings book series. 230 pages. Illustrated with B&W photographs. $29.95. Hamilton Parish was not the original name. It was Harrington Tribe, after and a slight misspelling of Lucy (nee Russell) Harington, or Harrington.. She was born in 1580, the daughter of Sir John Harington of Exton and died in 1627. She spoke French, Italian and Spanish. 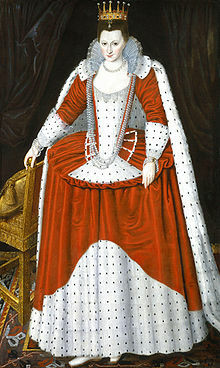 On December 12, 1594, at the age of nearly 14, she married Edward Russell, 3rd Earl of Bedford, then 22. She was a wealthy and influential woman, a major aristocratic patron of the arts and literature in the Elizabethan and Jacobean eras. Some have referred to her as the universal patron of poets. (Part of the Parish and a local Government run school have Harrington in their name. (Another historical narrative shows, wrongly, a point that has never been corrected, that this parish was once called Bedford Tribe, after the Duke of Bedford, her husband. It was never called that). After the financial misfortunes of herself and her husband came another wealthy aristocratic patron, James Hamilton (1589-1625), 2nd Marquis of Hamilton in the Scottish peerage. He bought out Lucy Harington's interests. The Scottish town of Hamilton, not far from Glasgow, was named after his family's extensive land holdings He was one of the many Scots peers who accompanied King James VI of Scotland and first of England to London when he ascended the throne on the death of Queen Elizabeth 1 in 1603. He was one of the gentlemen Adventurers who invested in the Bermuda Company to colonize it from 1615. As he was the largest shareholder in the original Hamilton Tribe, it took his name and the parish bears his coat of arms of the time. Loyal Hamilton was once proposed as a husband for the King's daughter. 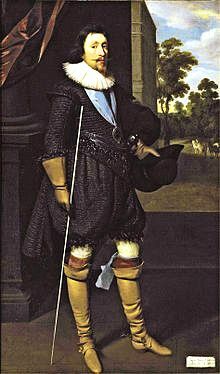 In 1620, he became a member of the Council for the Plantations of New England and later was rewarded as a Knight of the Garter. He died of a malignant fever in 1625 and his death is said to have hastened that of his Royal friend. His son and heir was executed for treason in 1649, his title reverted to his brother William and on his death in 1651, to his eldest surviving daughter Anne, Duchess of Hamilton in her own right. British Governor William Hamilton, after whom Bermuda's City of Hamilton eight miles away from this parish is named, was related to this Scottish House of Hamilton. There is still a Duke of Hamilton. Early settlers called the Parish or Tribe Bailey's Bay. In 1623, adventurer Captain John Smith, famous in American, Bermudian and British history, encountered many spooky caves in this Parish. It is unrelated to the City of Hamilton eight miles away. It is Bermuda's second most eastern Parish, on the North and South Shores. It has deep water limestone caves, with subterranean passages. They have stalactites and stalagmites of Gothic grandeur. They began during the Pleistocene Ice Age. Sites include the Crystal Caves and the Grotto Bay Hotel's Cathedral and Prospero's Caves. Sometimes called Abbott's Head, it is on the north shore of Harrington Sound. There is an eastbound bus stop at Francis Patton School (on the opposite side of North Shore Road from Abbot's Cliff Drive; use the pedestrian crossing) and there is a westbound bus stop on North Shore Road at the bottom of Abbot's Cliff Drive. Visitors can enter the nature reserve from North Shore Road via Abbot's Cliff Drive, and proceed through the neighborhood, taking the right-hand fork down Abbot's Cliff Close to the reserve. There is a small paved turn-around area at the reserve. Alternatively, visitors may enter Abbot's Cliff Road and follow it around to the right until it dead ends at the reserve entrance sign. There is very limited space to park at this entrance. 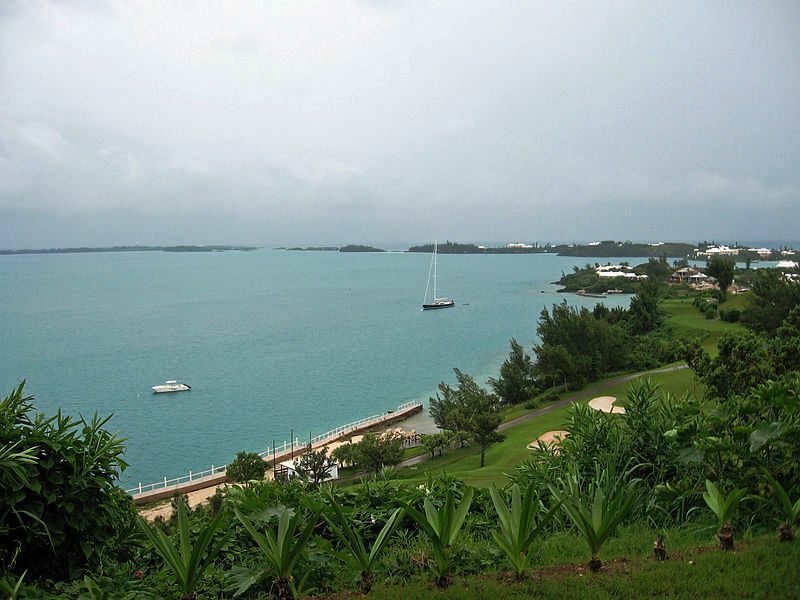 The site was added to the Bermuda National Parks & Nature Reserves system in the latter part of the year 2000. Abbott is an old Bermudian family name. The park is in two separate areas of land, one of 5.61 hectares (13.86 acres) and the other of 1.77 hectares (4.36 acres), for a total area of 7.38 hectares or 18.22 acres The cliff is reputed to be all that remains of a huge prehistoric cavern. There is a sheer wall of limestone between My Lord's Bay and Church Bay. It includes Abbott's Cliff Road and Abbott's Crescent. The park has splendid walking along unmarked trails and lovely frequent views of Harrington Sound and its islands. 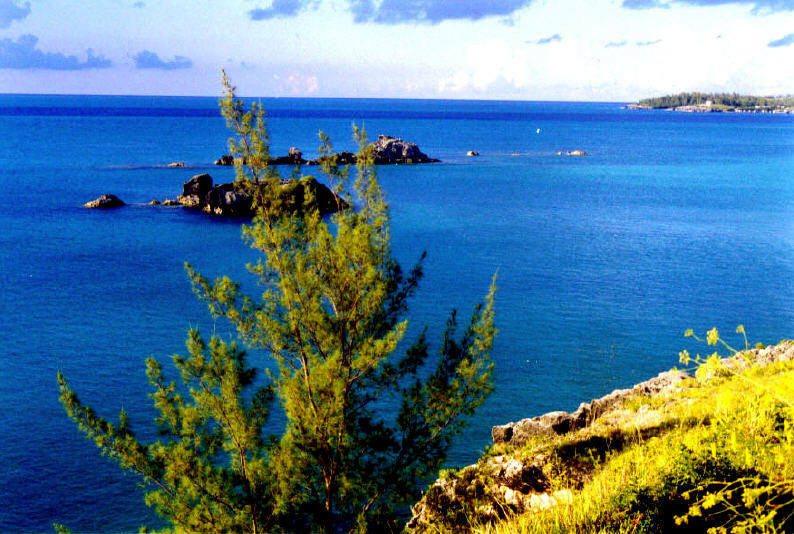 Most visitors are unaware of the scenic beauty of Bermuda as it once was on this walk and the great variety of plants they can see. The site remains an important refuge for rare native and endemic plants that have disappeared from other parts of Bermuda. Rare species found here include the Toothed Spleenwort, Bermuda Bedstraw, Snowberry and Wild Bermuda Pepper. Bus routes 10 and 11 service the area. This small bay is off the North Shore Road, opposite Bay Island. But it's also the local residential area that encompasses Bailey's Bay itself and the area south and east of it, including the Crystal and Leamington Caves, Fractious Street, Swizzle Inn, Trinity Church Road and the Church itself. Nearby are several coastal park like areas, a public dock and small public beach. Plus, from this public beach, gazing north, one can easily see - and swim to - Bay Island (see "Islands") with its nice beach. 40 North Shore Road, Flatts FL 04. Phone (441) 293-2727. A major Bermuda attraction, suitable for all the family. Next to Flatts Bridge, where the Atlantic Ocean flows into First Flatts Inlet and then the inland Harrington Sound lake. It dates back to the first decade of the 20th century when scientists from distinguished American universities set up a summer camp to carry out oceanographic research at Bermuda. A local sister organization known as the Bermuda Natural History Society, established in 1901, provided a year-round aquarium for the scientists. 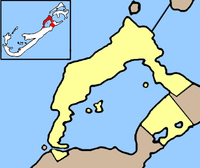 It began at Agar's Island (see Bermuda Islands) and moved from Agar's Island to its present location in 1926 when the two groups split. Today, The Aquarium, Museum and Zoo have fascinating displays of animal, aquatic and marine life and natural history. The Aquarium alone, pictured above, is superb. You could easily spend the best part of a day here, whether you arrive by air or cruise ship. An admission fee applies. Bermuda sea shells. The largest and most complete collection of Bermuda shells to be found anywhere in the world was donated in October 2001 to the Natural History Museum at the Bermuda Aquarium, Museum and Zoo. They were collected by retired Bermuda banker Jack Lightbourn and his late colleague and friend Arthur Guest since 1965. There are about 7,700 species in all. Entrance to the first is where Blue Hole Hill meets the Causeway. Take Bus routes 1, 3, 10 or 11 to the Grotto Bay Hotel bus stop. 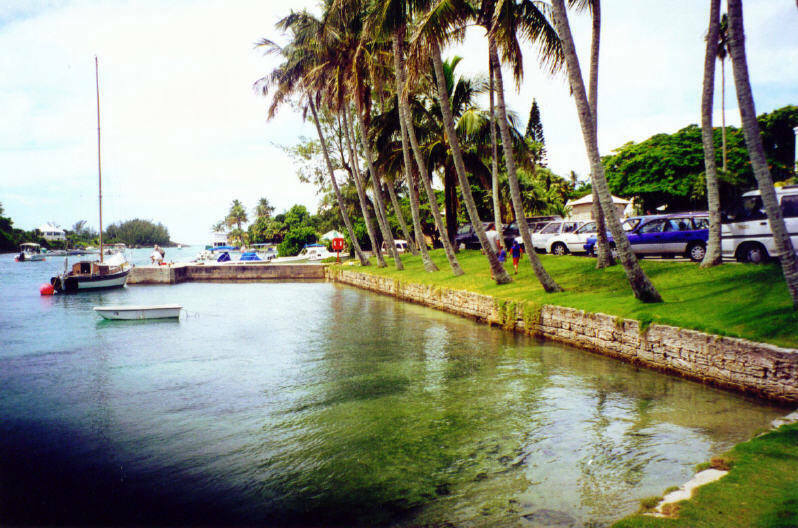 It is a Bermuda Government preserve, a public park, with parking. Blue Hole Park, once (in the 1960s and 1970s but long since gone home to a popular Dolphin Show), is honeycombed with caves, including a cave mouth called Causeway Cave and caverns along the shoreline filled with seawater. A land and sea park treasure. Bring a swimsuit and towel, sandwiches and a drink. See pools for bird watchers and walking trails. Access the sea amid glades of mangroves. At high and low tides, there are places to swim but not much beach at high tide. Wear old sneakers to avoid submerged rocks or clam shells. Avoid where the sand blends into deep mud and sink holes. Follow the coastline to your right. See caves with their access almost completely hidden. Some have deep water pools. Further south, the park merges with the large Walsingham Trust property (private, locally owned, but free entry, known as the Walsingham Nature Reserve, the center of which is Tom Moore's Tavern in that part of the Reserve known as Tom Moore's Jungle. It connects to Blue Hole Park through a woodland trail leading under bush archways. The latter, not really a jungle, more of a large and largely-untamed property (open sunrise to sunset daily, admission free), is technically owned by a private family trust but is open to the public. It encompasses coast and forested land from Blue Hole Park to Tom Moore’s Jungle (as Walsingham Nature Reserve is more frequently called). Tom Moore’s Jungle (accessed from Walsingham Lane, off Harrington Sound Rd.) is a natural mix of Bermuda cherry (hugely different from cherries of the UK, Europe, etc) tree forests, crystalline caves, and mangroves surrounding Tom Moore’s Tavern, a four-star restaurant housed in a 1652 waterfront inn. Both the tavern and jungle take the name of Dublin-born (then part of Great Britain so he was officially British, not Irish) Thomas Moore, an Irish poet–bon vivant, so hugely respected and venerated in the Republic of Ireland that there are gardens and numerous songs (as merely one example, the Last Rose of Summer) named after him. His romantic local verse early in his adult life during his brief stay (January to April 1804, during which time he was swindled, made to pay for another's wrongdoing, went back to the UK and later bitterly regretted ever having set foot in Bermuda) as an Admiralty (Royal Navy) court official registrar has perpetuated his name in local legend, if not fact. The Irish themselves never refer to him as Tom, always more respectfully as Thomas. Bermuda’s most famous tree, a calabash, is located here. Moore made it famous, using it's shade to compose his poems. From this fame, on November 4, 1844, members-to-be of what became the Royal Bermuda Yacht Club held their first meeting here. Highlights of the area are swimming grottoes, fed via subterranean tunnels by the tides of Castle Harbour. Fish can often be seen in the turquoise water. 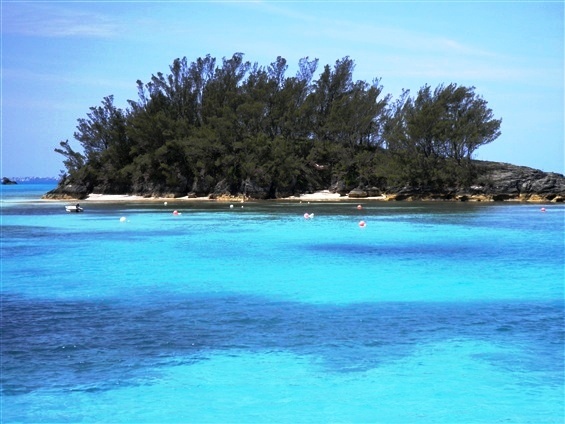 The Castle Harbor coastline here is also perfect for snorkeling; the shallow bays and mangroves invite hours of exploration. Bird-watchers will enjoy spotting not only the many herons that stalk crabs on the shore, but finches, cardinals, and doves. Caves honeycomb the woodlands. Part of this chunk of land is the 1.25-acre Idwal Hughes Nature Reserve, named for the Welsh-born senior civil servant and Public Works Director and architect who came to Bermuda, married an American lady and subsequently had Bermudian children). It is owned by the Bermuda National Trust and contains indigenous palmettos and cedars, along with unique geological formations. The region is also riddled with underwater caves, including the most famous, Crystal and Fantasy Caves, open to the public on payment of fees. Bermuda’s oldest rock, a very hard limestone estimated to be 800,000 years old, can be found at the surface in the Walsingham area. A small North Shore harbor for many boats, a picturesque marine cove, west of Shelly Bay Beach and east of the Shelly Bay MarketPlace grocery store. 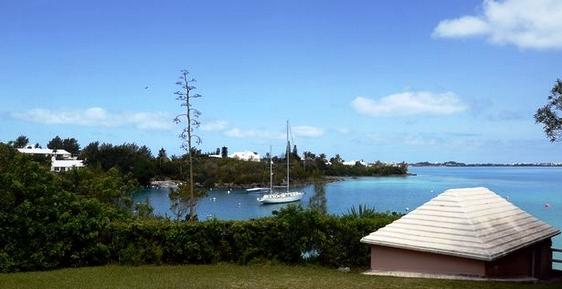 This exquisite large harbor is one of Bermuda's maritime gems. 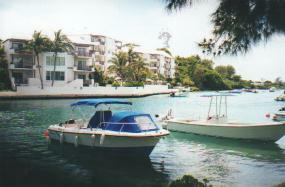 See it from an excursion boat from the Grotto Bay Hotel. 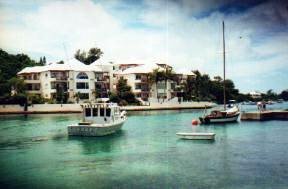 It is the magnificent waterfront and beach areas for much of both this Hamilton Parish and St. George's Parish. At one time, until the waters silted up too much, it was where the Royal Navy moored its vessels in Bermuda waters. A resident Admiral had his residence overlooking the harbor. There are many islands and beach areas. Castle Harbour has had a once-brilliant, then-somewhat sad hotel history. The first hotel here, which lasted until the 1990s, was the exquisite old Castle Harbour Hotel, then one of the finest in the world. 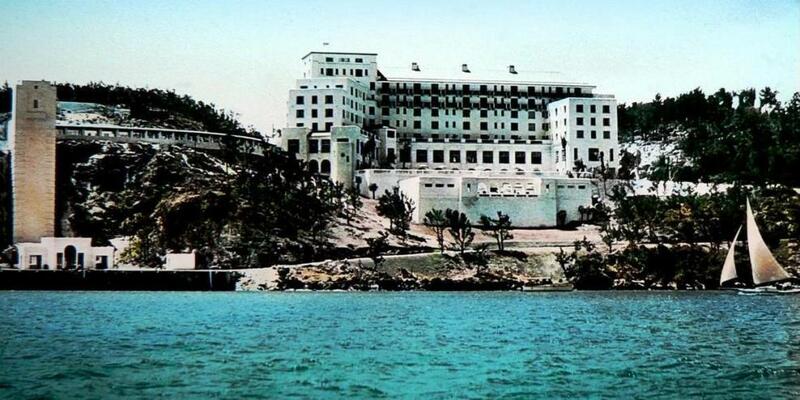 It was built in 1931 by the British shipping company Furness Withy, which from the 1920s until the 1950s had extensive business interests in Bermuda including this original hotel, also the Belmont Manor Hotel in Warwick Parish and two beautiful cruise ships the Queen of Bermuda and Ocean Monarch, both of which served Bermuda for generations until the late 1960s. But the original hotel development came at a huge cost to the environment. Before construction started in the 1930s, magnificent Church Cave and Bitumen Cave were at the entrance of the development. Church Cave was noted for having one of the largest underground lakes in Bermuda. During much World War 2, the Castle Harbour Hotel was closed to guests. When American troops were billeted in Bermuda, many stayed at the hotel until their US Army Air Force Base on St. David's Island a few miles away was built by American taxpayers. Some time after World War 2, Bermuda Properties Limited - which still owns the site - bought it from Furness Withy. But it continued as the Castle Harbour Hotel for many years afterwards. In the 1980s, the Marriott Hotel corporation acquired the hotel above, completed in 1931/1932 - but not the land - and saved but renamed the Castle Harbour Hotel. It became the much-changed in places Marriott's Castle Harbour Hotel. Later, Marriott's saved the old hotel, but added an unusual new development on the Castle Harbour side of it (as the photos above show). Millions of Marriott dollars were poured into it annually for years. Marriott's finally ceased its lease after incurring huge annual losses no longer allowed to be borne by American taxpayers and the hotel was closed in November 1999. 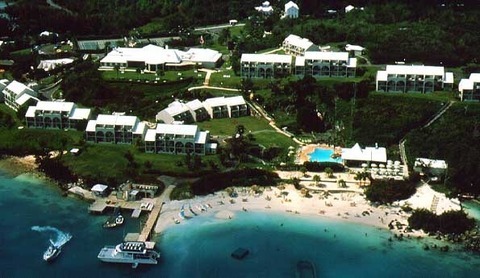 The old hotel and Marriott additions were later torn down by Bermuda Properties Ltd and rebuilt as the Rosewood-managed Tucker's Point Hotel and Club (see photo immediately above and Bermuda Hotels), with expensive villas and condos as new attractions for the wealthy. 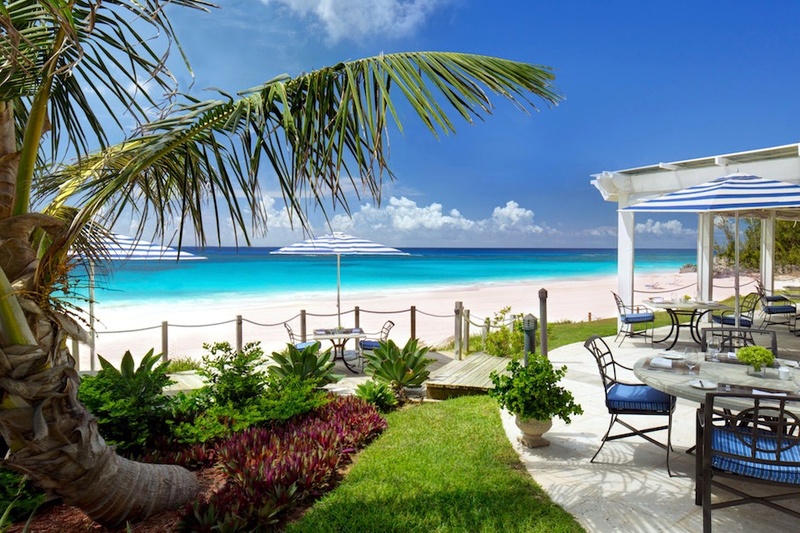 It was ceremoniously declared open on April 17, 2009 by film stars Michael Douglas and his wife Catherine Zeta-Jones, both of whom then lived in Bermuda. Luxury homes and luxury town houses are on top of Ship's Hill, almost directly above Church Cave. Hamilton Parish Side. The Causeway itself is not merely a bridge as often assumed by visitors. It spans Castle Harbor as a series of flat and arch spans. It is the narrow, man-made strip of land linking Hamilton Parish with St. George's Parish. It was first built in 1864 by the Bermuda Government, rebuilt in 1871 after the first hurricane and originally stretched from Blue Hole Hill to and through Long Bird Island. It is the only link between St. George's, the Airport and the rest of the Island. .
At one point it linked up with the old Swing Bridge to St. George’s. When construction began at the US military base Kindley in 1941, part of Long Bird Island was demolished, and the passageway between the islands filled with dredged material to create the airfield. It has been rebuilt several times again because of hurricane damage. Longbird Bridge is at the airport end of the causeway and is so-called because it was part of Longbird Island until 1942. Where the nearby airport and adjacent area is now was was once a line of islands, Jones', 2.5 acres; Little Round, Long Cay, Round and Sandy. Long Bird Island, once 62 acres, was the biggest of these islands. This bridge, the smaller of two swing bridges in the area, is a two-span steel girder with an open grating traffic deck. In its closed position, it lets traffic pass over it and is supported at the east and west abutments and at the pivot pier immediately under the control house. When the bridge is opened to allow the passage of boats, all road traffic stops on either side of the bridge and the east and west supports are withdrawn. In this position, the bridge becomes a balanced cantilever supported only on roller wheels on the pivot pier. It can then be rotated by hydraulic rams to its open position. In this condition, balance is provided by a concrete counterweight on the bobtail span and the bridge cannot carry traffic. 2017. December 5. Replacements for Swing Bridge (St. George's) and Longbird Bridge are in the pipeline after a contract for design work was handed to a British team. Both of the East End structures have suffered major deterioration in recent years, and Swing Bridge was subject to emergency repair work under the One Bermuda Alliance government. A press release from British firm Double Unit announced a contract for full design services has been awarded to lead consultant Ramboll, Knight Architects and Eadon Consulting after an international tender. The two bridges form a critical link in the infrastructure of Bermuda, connecting LF Wade International Airport with Hamilton to the west and the Town of St George to the east. Longbird Bridge was originally constructed in the 1950s as a 60 metres-long twin carriageway steel swing bridge at the east end of the Causeway connecting the island with the airport. However, the bridge closed to traffic ten years ago and was temporarily bypassed with twin Bailey Bridge structures. Swing Bridge spans 120 metres across Ferry Reach, linking St George’s Harbour with the west of the island, and is a critical link for both vehicular and marine traffic. The 1960s swing bridge has received extensive refurbishment and remains open to vehicles but no longer opens to shipping. According to the press release, the design team will undertake studies to determine the most appropriate solutions for the new bridges, including fixed and moveable structures. It added that robustness and durability are key factors as both existing bridges have suffered accelerated deterioration in the tropical climate, which is particularly aggressive to steel structures. In addition, the structures and their mechanisms must be designed to withstand the hurricane-force winds that Bermuda periodically suffers. The design team have collaborated on many bridge projects and between them are responsible for award-winning moveable structures, including the Twin Sails Bridge, Poole (Britain), Gateshead Millennium Bridge (Britain), Lower Hatea Crossing (New Zealand) and Merchant Square Bridge (Britain). Commenting on the appointment, Peter Curran, bridges director at Ramboll, said: “We are all delighted to be working on such an exciting project with the Government of Bermuda. We look forward to collaborating to deliver a strong and lasting landmark for the island, one which inspires, connects and can endure the heavy weather conditions that Bermuda has previously suffered.” Martin Knight, director at Knight Architects, said: “Bermuda is a beautiful and inspiring location for any designer, and it is clear how important these connections are in the everyday life in the island. These bridges are also the entry point for countless tourists every year and they offer an opportunity for gateway structures which reflect the culture and identity of a truly unique place.” Work on the project will start immediately. Bumping over the old barge bridge became a thing of the past in late 1952 when Kindley AFB's new Long Bird Bridge. built by the US Military, was officially opened. (Technically, at that time, it was part of what had been since 1941 the leased Kindley Air Force Base of the US Army Air Corps, later the USAF). 53 years old in 2003, its lifespan of 50 years was almost over. The Bermuda Government announced in July 2000 plans to replace the bridge with a fixed-span overpass giving clearance of between 30 and 40 feet to marine traffic passing below it but this was done. Instead, repairs in 2001 extended its life. Engineers ere not in favor of replacing the bridge with a new swing bridge because the more moving parts there are, the more likely it is that corrosion and breakages will occur, especially in an exposed location. 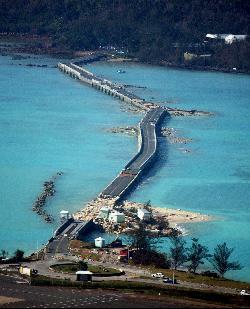 In 2002, the US Government, in lieu of all other Bermudian claims that the USA caused serious environmental damage at the former US Naval Air Station nearby and Naval Annex in Southampton Parish, gave the Bermuda Government US$11 million, equivalent to the replacement cost of Longbird Bridge. Some re-construction in mid-2003 reinforced the flat spans, casting them as arches. Only one lane was open to traffic until completion in August 2003. The construction caused long, tiresome delays, made worse by timed traffic lights which mopeds and scooters use illegally by going in front, much to the annoyance of persons in cars, trucks and taxis. It was damaged extensively with a death involved, during Hurricane Fabian of September 2003. On Friday January 26, 2007, it was closed for four hours, nearly 500 people went without power and hundreds of schoolchildren and workers were sent home as hurricane force winds battered Bermuda. With gusting winds hitting 75 knots, flights from Bermuda International Airport and ferry services were also cancelled. Public Safety Minister David Burch shut the Causeway at 1.30 p.m. for safety reasons, with sustained winds at 45 knots. It remained shut until winds dropped at about 5.30 p.m., leading to scores of frustrated motorists in lengthy tailbacks. All Government schools were closed at lunchtime after power outages at five schools across the country, with a number of private schools following suit. In the afternoon, a Continental flight from Newark was delayed, while JetBlue and Delta’s Atlanta flights were cancelled because the closure of the Causeway meant people could not reach the airport. People called the Government to complain about the closure of the Causeway, but it was done for public safety. Government had set guidelines to shut it in strong winds in the light of Hurricane Fabian in 2003. Following Fabian, the Government took the stance that when wind speeds rose above 45 knots the Causeway would be closed to vehicular traffic. In mid 2007, work began on replacement bridge being erected alongside the original. Traffic was restricted to one-lane traffic for almost two months after it was deemed unsafe due to storm damage. The intention is for the replacement bridge to ease traffic, while a five-year programme of maintenance work is carried out by the Ministry of Works and Engineering. On February 23, 2009 it was announced the new Causeway will cost up to $90 million but most of this will be funded by private developers. Government will push ahead with a replacement bridge, and will seek a Public Private Partnership (PPP) to pay for it. Geotechnical investigations obtain information on the physical properties of soil and rock around a site prior to designing structure foundations. Engineers will carry out the study in order to identify where the bridge footings will be located. Construction of the new causeway could take up to three years. The start date for construction is currently under review. The initial design was a high level concrete bridge without an opening span to be built on a curved alignment to the south but close to the existing Causeway. Halcrow Group Limited of the UK has been contracted to undertake the feasibility study and the architects are currently Dissing and Weitling. The Ministry of Works and Engineering is currently undertaking a feasibility study to determine the suitability of PPP for the procurement of a New Crossing, Castle Harbour." A Public Private Partnership is an agreement with developers, investors, construction companies and other service providers to finance, build and operate assets such as highways, hospitals, schools and power plants in a long term funding contract. Government began public consultation and a feasibility study into the New Crossing in 2006. 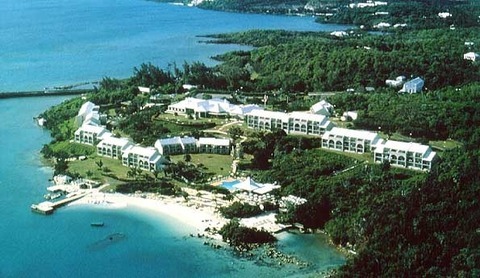 Situated in the grounds of the Grotto Bay Hotel. Well worth seeing, especially for those not familiar with caves systems. Bermuda's caves are unique. Featured on a 2002 $1 Bermuda postage stamp. Believed to be connected underwater with Prospero's Cave. Wilkinson Avenue, Hamilton Parish. A lovely historic Bermuda manor house property built in 1907 in the colonial architecture style. Its features include traditional Bermuda architecture such as a cedar staircase in the front hall. One of its early inhabitants was William Wilkinson, a crew member on-board the Eliza Barss (thus later, in the 1950s, the name of a Bermuda grocery store) that sailed from New York delivering cattle to British soldiers in Bermuda. Mr Wilkinson later became an American citizen and joined the US Coast Guard. On February 2, 2018 the United States government bought the property which had earlier served as the official home for the Consul General. The US had leased Cedarhurst for the past nine years. 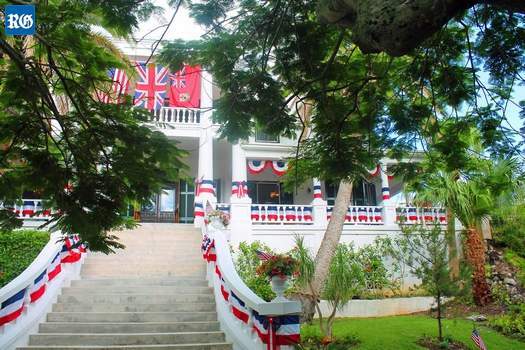 Consul General Mary Ellen Koenig said: “I am delighted that this gracious and lovely Bermuda home will serve as the permanent residence for future Consuls General. Cedarhurst has served the US Government well over the past nine years.” Cedarhurst was secured under a trust before its purchase this week by the US. (On the Bermuda National Parks & Nature Reserves Map). A small coastal marine area with a couple of small beaches. It is on the Bermuda Railway Trail. The small cove with boats moored in it used to be a lovely place to swim, but excessively long ropes for boat moorings now get in the way. Bermuda’s shoreline was once dotted with man-made fish ponds that were used for centuries as a simple larder to store fish and turtles — but faded from use with the advent of refrigeration. The three Crawl areas here in Hamilton Parish - with Crawl the name of the area in which each are located - all take their name from the storage ponds of that name, similar to the word “corral” as a pen for livestock. Now, they are largely forgotten. These storage ponds were a distinctively local innovation. Bermuda is the only place where they were widely used — other than Hawaii, where a similar geology of limestone on top of volcanic rock is found. 8 Crystal Caves Road, off Wilkinson Avenue, Bailey's Bay, CR 04. Phone (441) 293-0640. Fax (441) 293-7334. Email info@caves.bm. Bus routes 1, 3, 10 and 11 stop nearby, at the Swizzle Inn. For moped users, there is free parking. Open daily, 9 am to 5 pm, last tour 4:30 pm. Reservations not required. The property is owned by the local Wilkinson Trust. If you are disabled or a member of your party is, or have limited mobility and encounter difficulty with slopes or steps, telephone or email to ask if the facilities/galleries can be accessed. Admission per adult can be for one or two caves (both are quite different in many respects and both should be viewed), less for children. One of Bermuda's outstanding scenic attractions. With beautiful examples of Mother Nature's underground architecture over millions of years. Bring a light sweater to wear in the cave. It was first discovered in 1904 by Carl Gibbons and Edgar Hollis, two local boys searching for a lost soccer ball and opened to the public three years later. Ever since then they have been tourist attractions, with Crystal Cave featured on a 2002 70-cent Bermuda postage stamp. 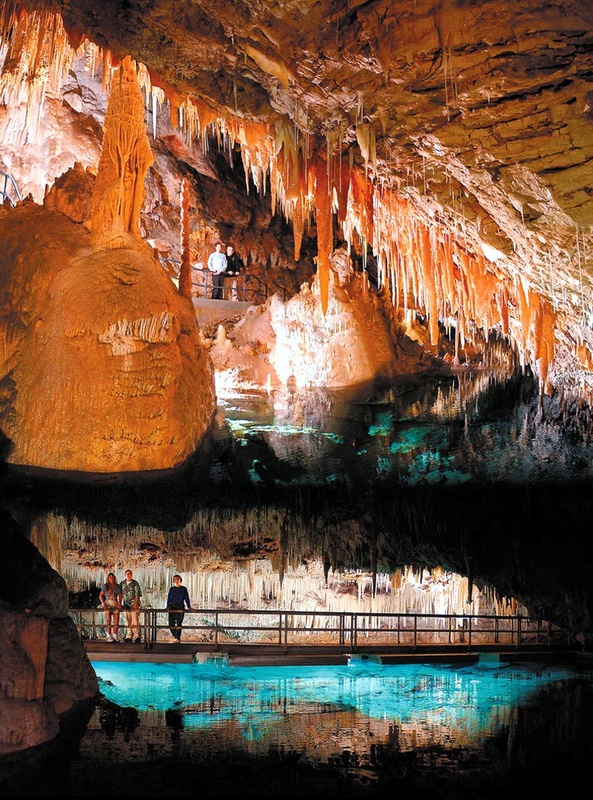 See stalactites, stalagmites, ice soda straws, helectite formations and crystal clear deep pools. There are underground passages galore, most too narrow to allow inexpert access. Over a single period of one hundred years, only one cubic inch of a formation in this magnificent Gothic Palace of columns is created from the microscopic particles of limestone suspended in the relentless drips of water. 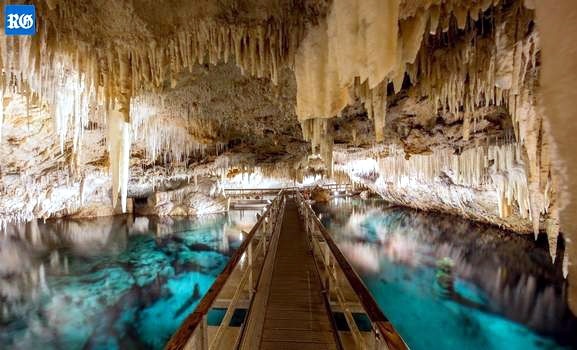 Bermuda’s caves are home to about 60 native and indigenous marine invertebrates, ranging in size from large shrimp to microscopic organisms, with some species found only in a single cave. Here, the water is 55 feet deep yet so clear the bottom can be easily seen. Mark Twain, who visited Bermuda repeatedly, visited here shortly before he died and loved it. In the 1950s, boys from what was then the local Boy Scout Cub Walsingham pack used to come down here regularly and swim, under supervision. Cavers galore internationally have explored this unique cave, the waters of which have not yet been completely explored and mapped for all to see. Only registered cavers are allowed to go below-ground, with permission obtained well in advance from the Wilkinson Trust. Fantasy Cave. Wilkinson Avenue, opposite the Crystal Cave. Buses 1, 3, 10 and 11 stop nearby. Also owned by the Wilkinson Trust. It was discovered in 1907 by Arthur E. Haycock and opened to the public as Wonderland Cave, but was closed in 1931. It re-opened on July 30, 2001 after some delays, as Fantasy Cave, re-developed and illuminated. It is featured on a 2002 35-cent Bermuda postage stamp. It is gorgeous, smaller than the Crystal Cave but with something quite different to see. (On the Bermuda National Parks & Nature Reserves Map). A 3.5 acre plot by Shelly Bay Park. It once had an inland tidal pond, thus the name, but this was filled in with sand from the dredging of Flatt's Inlet in the 1920s and 1941. 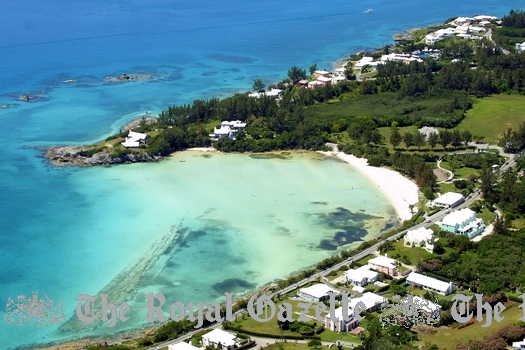 Buy Back Bermuda (BBB) has been appealing for donations for its campaign to preserve this property for future generations. Campaigners from the Bermuda National Trust and Bermuda Audubon Society are involved. 2018. April 13. A plan to restore a pond filled in more than 75 years ago has been given the green light. The Development Applications Board backed a plan by Buy Back Bermuda to restore Eve’s Pond in Hamilton Parish as part of a nature reserve. Andrew Dobson, president of the Bermuda Audubon Society, said the organisation is happy that work could soon be under way. He said: “We really look forward to providing the public with another nature reserve that everyone can enjoy.” Mr Dobson added: “The plan is to create a brackish pond to provide a habitat for migratory ducks and other wetland bird species. Invasive plant species will be cleared, and the sand removed will be used to build an embankment along North Shore Road. This embankment will be planted with native and endemic plants. Just like our Buy Back reserves in Southampton and Somerset, there will be a nature trail with interpretive signage as well as an observation platform.” Eve’s Pond was a tidal, saltwater pond in Hamilton Parish until 1941, when it was filled with sand dredged from Flatts Inlet. 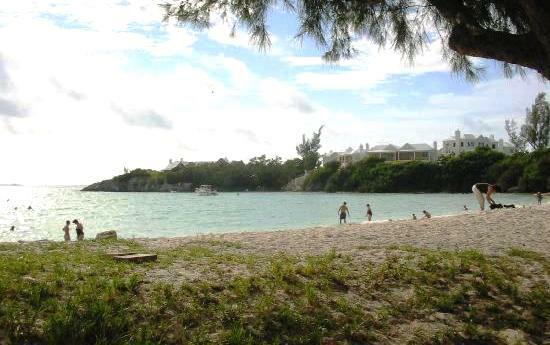 The property on North Shore Road was bought by Buy Back Bermuda, which was launched by the Bermuda Audubon Society and the Bermuda National Trust. The original pond was about 50 metres wide and 100 metres long and was linked to Harrington Sound by the Green Bay cave system. The new pond will not connect to the caves in a bid to prevent further damage to the system. Midway between the City of Hamilton and Town of St. George, on the North Shore Road, after passing over Flatt's Bridge, see above top photo, going east. Route 10 and 11 buses stop in and near the village. 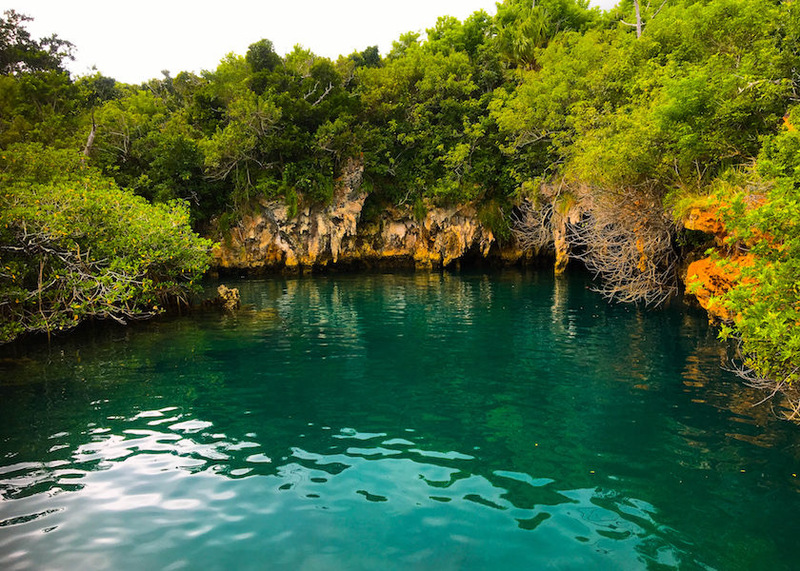 It is a magnificent lagoon, the only one of its type in Bermuda. View it best from the dock opposite the Bermuda Aquarium, Natural History Museum and Zoo. Face south for a view of Flatts Inlet, or north for Harrington Sound. Under Flatts bridge, the water either surges into Harrington Sound from the Atlantic via Flatts Inlet, or flows out in the reverse direction. Flatts Bridge was built between 1871 and 1877, deliberately as a fixed structure not able to be raised or lowered to allow larger vessels to pass though because the days when such large sailing vessels used Harrington Sound for cargo or passengers or both had long gone. The days of Flatts as an independent part were a thing of the past. 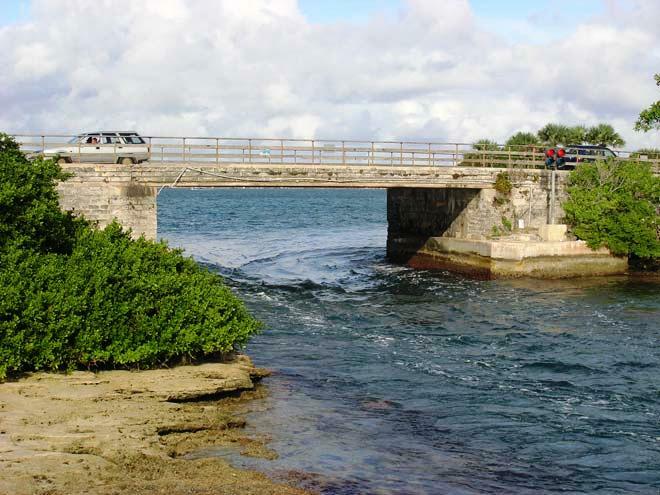 Today, the bridge, next door to the Bermuda Aquarium and Museum, is part of the main North Shore road linking Flatts with St. George's to the east and Somerset to the west. Often, see fish or squid flowing with the tide. People gazing at the tide rushing under Flatts Bridge are only partly correct in thinking this is how Harrington Sound to the north of the bridge fills and empties. The racing current is just a fraction of the daily ebb and flow. Most of it slides silently through hidden caves and tunnels. There is a vast underground labyrinth of them stretching the length of the Parish and from coast to coast in the Parish. Most of the network is entirely under water. Under water caves look exactly like above-water caves. The Bermuda Cave Diving Association has lines connecting them. Four Photographs above by author Keith A. Forbes. Experienced cave divers, local or visiting, can find out more. Elsewhere in the village, major wharf improvements have occured, complete with construction of a sidewalk, lamp posts, a grounded seat wall and two steps separating the sidewalk and the dock. On a Saturday every October, the Flatts Festival takes place here, with traffic banned, with artists and other attractions. The attractive condominiums on the south side of Flatts Inlet are St. James's Court built by insurance firm Liberty Mutual, of Boston, Massachusetts. Flatt's Village has lovely (expensive) condominiums, guest accommodations, restaurants, small shops and docking. It was once the haunt of smugglers. For people who arrive by bus, it is an attractive village. But for those who come by moped or scooter or car - and the elderly or disabled - the road is narrow, there is still no sidewalk or pavement through the village itself, traffic is usually heavy and there is no parking. Flatts in 1930s then with Frascati Hotel (became the Coral Island Hotel, later demolished for condominiums). Photo taken in 1952. The Hamilton Parish coastline and points of interest of this large inland lake (see photo by the author) are lovely. The Sound was named after Lucy Harrington, a wealthy and influential women in the Elizabethan era who did so much for the Parish. In its own way, Harrington Sound is as glorious as the lakes of New Hampshire, Maine, and the Lake District of England, for fishing, swimming, sunfish sailing, kayaking. It is not the crater of an extinct volcano as often assumed. Its islands include Hall's Island, Rabbit Island and Trunk Island. Some are inhabited year round. View its many facets from the Harrington Sound Road. There are lots of bays, caves, cliffs and coves, but not many beaches. Harrington Sound marks the lowest point on the Bermuda sea platform. It is quite deep, about 23 meters (about 70 feet) at Devil's Hole. Its geological formation is not yet fully explained. Under Flatts bridge, the water either surges into Harrington Sound from the Atlantic via Flatts Inlet, or flows out in the reverse direction. Flatts Bridge was built between 1871 and 1877, deliberately as a fixed structure not able to be raised or lowered to allow larger vessels to pass though because the days when such large sailing vessels used Harrington Sound for cargo or passengers or both had long gone. The days of Flatts as an independent part were a thing of the past. Today, the bridge, next door to the Bermuda Aquarium and Museum, is part of the main North Shore road linking Flatts with St. George's to the east and Somerset to the west. 2017. July 21. The sale of the Harrington Sound Post Office has been completed. The post office was closed in November 2014 and the property was formally put up for sale in May 2015. It was sold for $700,000, according to the Ministry of Public Works. 2016. June 17. The former post office at Harrington Sound has been approved for sale at $700,000 by the House of Assembly. Public works minister Craig Cannonier told MPs this afternoon that marketing of the 0.2-hectare site with its 864-square foot main building was begun on May 11 last year, and closed six weeks later. The Government expects to raise $10 million from the sale of 30 properties over the next three years. Eight government properties have been identified for this fiscal year. Speaking for the Progressive Labour Party, MP Dennis Lister said the Opposition had no problem with the sale of government lands, noting that the minister had informed him that a stretch of roadside land had been retained from the property in the event that a sidewalk might be needed in the future. 2016. May 30. The former Harrington Sound Post Office could be sold for $700,000, according to a draft Sale and Purchase Agreement. The document, tabled in the House of Assembly last Friday, lists the potential buyer as Frank Martin Pollard. In addition to the Hamilton Parish property itself, the buyer would obtain the former post office building, which is described as: “part single/part two-storey, consisting internally of an open space, a kitchenette, toilet and a secure store room to the rear of the main building. At a lower level is another toilet and a detached store.” The draft documents call for $70,000 deposit for the land purchase. The post office was closed in November 2014 and the property was formally put up for sale last May. Craig Cannonier, the Minister of Public Works, noted that the sale of Harrington Sound Post Office was the pilot phase of the policy of selling off surplus government land. An interesting, scenic ride by moped or the # 3 bus route. Bear east along this road, skirting the Sound, after Devil's Hole. The Hamilton Parish portion begins shortly after the junction with Broken Hill Road on the right and continues all the way to the junction with Wilkinson Avenue. En route are beautiful vistas of the Sound in all its different facets, some inland areas, the Plantation Restaurant, Leamington Caves, and Tom Moore's Tavern. Trinity Church Road, Church Bay, Harrington Sound. 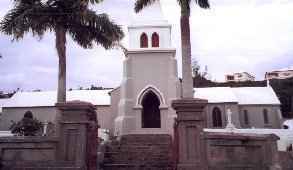 This is the third oldest of the Anglican Parish churches in Bermuda, dating back to 1623. The tower and spire were added in the 1890's, gifts of Bermudian William D. Wilkinson, who studied architecture in Toronto, Canada. The bell in the tower was from the foundry of Mencely & Co. of West Troy, New York. Weighing more than 1, 211 pounds, it was placed in memory of the Reverend Alexander Ewing, Rector of the Parish from 1791 to 1817. The graveyard overlooking the water is tranquil. Bay Island. Off the North Shore. The name indicates its proximity to Bailey's Bay, 400 yards to its south. It is accessible to the public. It is also a refuge in the winter for sea birds. It is charming, interesting, small and rocky. It has two small low tide beaches on the southwest side. These catch the full sun only in the morning and up to about 2 pm. There are interesting shells in the shallow water off the southeastern side. To get there, take a bus (the 10 or 11 routes) to the beach at Bailey's Bay. Be a decent swimmer. Wear a pair of old sneakers to protect your feet from the island's sharp rocks. As a safety backup, bring a companion. Use a floating, lightweight, waterproof, plastic or Styrofoam container big enough to carry a camera, wristwatch, towels, street clothes, bus tokens or tickets and food and drink to your taste from a supermarket or deli, or pre packed for you by your hotel. Before you swim, look at the tide table in the daily newspaper. Start out when low tide is in the morning. Walk part of the way out before you hit deep water. You'll find the island well worth your time and trouble, a super site for a picnic and relaxing in the shallow water. Make the journey back to the mainland before high tide, to avoid a strenuous swim. Put your street clothes over your swimsuits and wring out your sneakers before boarding the 10 or 11 bus at the stop nearby. You can easily swim to this island and enjoy its low-tide beaches shown, from Bailey's Bay mentioned above. Crow Island. East of Trunk Island, Harrington Sound. Hall's Island. Very small, north east of Trunk Island, in Harrington Sound. In the 1970s, until 1978, it was the site of an experimental Gibbon ape colony. For a while, they were replaced by eleven macaque monkeys. Inner Dumpling. East of Outer Dumpling, Harrington Sound. Outer Dumpling. South of Hall's, Harrington Sound. Rabbit Island. Sometimes called Collins Island, perhaps after a family who owned land on the mainland. South west of Trunk Island and Major's Bay in Harrington Sound, it is a nature reserve leased to the Bermuda National Trust, therefore not accessible to the general public. Longtail birds and rabbits are common here. Redshank Island. In the extreme south west of Harrington Sound, immediately off Green Bay. It was named after a bird that inhabited shores and nested here, with pale red legs and feet, now the common tern. Stags, The. Off Shelly Bay, North Shore. Trunk Island. 7 acres. Largest island in Harrington Sound. It was once a summer camp for Bermudians including Girl Guides. There is an annual swimming race to and from there. It has a large house and cottage, a rugged shoreline with a small beach and sheltered coves for small craft. The Bermuda Zoological Society has a habitat restoration effort to replant native and endemic species, cull invasive species and include excursions to Trunk Island in its education and conservation programs. December 14. Artex employees and their family members helped remove invasive Brazilian pepper trees from Trunk Island. The island in Harrington Sound, owned by the Bermuda Zoological Society, is used for overnight camps, educational workshops and nature encounters. Last week, a team of 17 people from Artex culled and removed the invasive trees to help restore of the island to its native habitat. Colin Brown, president of the BZS, said: “Thank you to the team from Artex for all their hard work during their corporate day of giving out on Trunk Island. It is with this kind of support that we can continue to work towards our goal of returning the island to its native and endemic state, in order to preserve it for future generations.” Robert Eastham, managing director of Artex in Bermuda, said: “Artex has been part of the Bermuda community for 20 years and we’re proud to support its continual development. The conservation of our island and the ability to teach both children and adults to understand and respect what makes us unique is a privilege. We’re so happy that we have the chance to give back to our local community.” For more information about Trunk Island, visit www.bamz.org/community/trunk-island. 21 rooms and suites. 1 Mid Ocean Drive, Tucker's Town, Hamilton Parish. Or by airmail at P. O. Box HM 1728, Hamilton HM GX. Telephone: (441) 293-0330. Fax: (441) 293-8837. Cottage colony and Private club. Must be a member or referred by one to stay. For the affluent. 2011 room rates April through November per night are, for a member, single from $310, double from $320; non-member single from $360, double from $370. This property was one of those begun by the British shipping organization Furness Withy in the 1920s that really began Bermuda's climb in tourism. On a 640-acre estate in the most exclusive area of Bermuda, with numerous beautiful residences and 3 large private beach areas, unique features of which are natural arches, plus coves on the estate, accessible by a private road to the Tucker's Town peninsula usable only by Club members. The world-famous Mid Ocean 18-hole golf course was first laid out by Charles Blair MacDonald, who created what became the National Golf Course in the USA. It is often ranked as one of the 10 best golf curses in the world. There are also 2 tennis courts and a tennis pro. With fine dining in its own restaurant, plus a Beach Cafe. 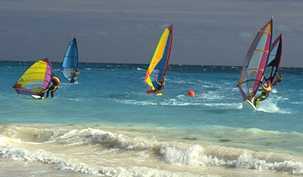 It has received the Bermuda Government's Tourism Longtail Merit Award. On bus route # 1. 1 Mid Ocean Drive, Hamilton Parish (East End). Phone (441) 293-0330. Fax (441) 293-8837. Designed originally by Charles Blair MacDonald to fit into the natural terrain. It was a par-71 layout, over 600 acres of rolling countryside, 6,519 yards from the back tees. MacDonald won the first US Amateur Golf Championship in 1895 and later designed the National Golf Course in the USA. The course first opened in 1922. Ralph A. Kennedy of Mamaroneck, NY, regarded at the time as the "Dr. Livingstone of Golf," rated it one of the five best courses in the world in the 1920s. In recent years it was once ranked 45th by Golf Digest for courses outside the USA. 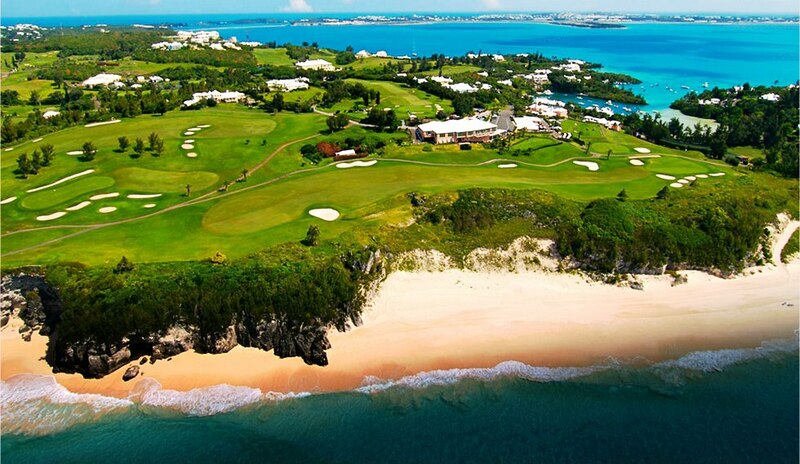 Bermuda's number one private course. It was revised in 1953 by international golf course architect Robert Trent Jones. US Presidents Dwight Eisenhower, John F. Kennedy, Richard Nixon, George H. W. Bush and Jimmy Carter have played here, as well as the Duke of Windsor in 1940, British Prime Ministers Sir Winston Churchill, Harold MacMillan and Edward Heath. Golf professionals Robert Jones, Sam Sneed and many other celebrities also have golfed here. When Babe Ruth, normally as good with a club as he was with a bat, played the 433-yard fifth, known as the "Cape," he knocked eleven straight balls into Mangrove Lake before finally driving one over the hazard. In the 1990s this course hosted the Merrill Lynch Classic and later the Gillette Classic. The first three holes run parallel to the ocean. All the greens were re-built in 2002. A private club, an introduction is needed from a member, or try an hotel's Social Desk or cruise ship's Shore Excursion office. The Hamilton Parish part of this mostly coastal main road stretches from Flatts Inlet, via the Bermuda Aquarium, Natural History Museum and Zoo and Shelly Bay, to Blue Hole Hill and the Causeway. If you're on a moped, you can explore its nooks and crannies, and admire its views. But don't walk it, except in areas with sidewalks, or on parts of the Bermuda Railway Trail nearby. Instead, take the bus. Routes 10 and 11 cover the entire route. Close to Harrington Sound, with its center near the junction with Harrington Sound Road and Wilkinson Avenue. A large network of underwater and below-ground caves, some isolated, others part of smaller networks. It includes Crystal Cave and Fantasy Cave, referred to earlier. Featured on a 2002 80-cent Bermuda postage stamp. 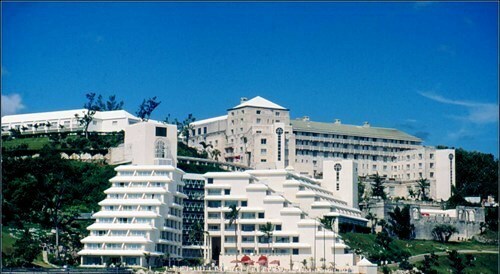 It is situated in the grounds of the Grotto Bay Hotel. It is reputed to have been discovered in 1609 by Admiral Sir George Somers. Prospero is a character from "The Tempest" of 1610 by Shakespeare, the true-life details of which are believed to have occured in Bermuda, not a mythical Italian island. See by name and Parish in Bermuda Cuisine. 60 Tucker's Point Drive, Hamilton Parish HS 02. Phone (441) 298-4000. Email Tuckerspoint@rosewoodhotels.com. Mailing address P. O. Box HS 85, Harrington Sound, Hamilton Parish, HS BX, Bermuda. Overlooking Castle Harbour. Newest hotel. So-called because it is professionally managed (but not owned) by the Rosewood corporation of Texas. Opened April 17, 2009. On 200 acres of waterfront. 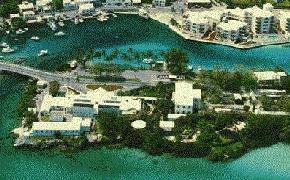 It is in the exclusive and private residential area of Bermuda known as Tucker's Town. A resurrection, reconstruction and reconstitution of the Castle Harbour Hotel, which opened in 1931 and closed in 1999, under a new name after the latter's demolition. The Castle Harbour Hotel was a landmark first planned by the British Furness Withy shipping organization in 1923 and first opened on November 1, 1932. Furness Withy built both the original Castle Harbour Hotel and the Mid Ocean Club. After World War 2 Furness Withy of the UK lost interest. The property and extensive land were bought by Bermuda-based Bermuda Properties Ltd (BPL), originally headed and owned by Juan Trippe. He was the founder of the original Pan American World Airways. It was a direct result of his interest in Bermuda after Pan American flew between Bermuda and New York from 1937. His son, Ed Trippe, now has control. The new (since 2009) $350 million, 200-acre development includes town homes, villas, two swimming pools, a golf course, beach and tennis club and more. The boutique hotel, designed to five-star standards, also offers a conference venue for Bermuda's established international business community. The centre piece is the Manor House, perched above Castle Harbour. Each of its rooms is decorated in a classic British style of artwork and furnishings, while the bathrooms feature deep soaking tubs, as well as expansive balconies and terraces with water views. The suites come complete with bars with ice makers and fireplaces, while the rooms are fitted with Wi-fi, VOIP telephony and IP-TV. The Palm Court, which is lined with palm trees, leads from a croquet lawn to a horizon pool overlooking a lush grotto and Harrington Sound. The spa has 10 tranquil treatment rooms and a Silver Tag hydrotherapy suite, with the women's salon offering manicure, pedicure and styling. There is also a barber shop. The 1,900 square-foot fitness centre is fitted with aerobic and cardiovascular equipment, in addition to weights, offers private wellness and conditioning instruction, while the dive and watersports centre provides dive adventures aboard the 31-foot Tidal Pull exploring shipwrecks and underwater caves. Diners have the Point Restaurant, accessed via an English long bar facing Palm Court. Point Terrace and the wine room, with its barrel-vaulted ceiling and selection of new and old world wines, provides a more private experience, along with al-fresco dining poolside at the Mahogany Terrace. The conference facility comprises computers, translation, IT support and secretarial services, in addition to satellite conferencing and a projection screen. 2011. A Special Development Order (SDO) was passed by the Bermuda Government, to allow a Tucker’s Point expansion of 78 homes and 70 hotel rooms, to provide more opportunity to erase losses and replace them with profits. A letter to shareholders from president Ed Trippe had revealed Tucker’s Point was losing more than $1 million a month from the start of 2009 to August 31, 2010. The majority of members of parliament said the move is vital for Bermuda’s tourism product, and would help ensure the success of one of the Island’s most lucrative resorts. A list of shareholders of Bermuda Properties Ltd (BPL) and its subsidiary Castle Harbour Limited (CHL) shows most of both companies’ shareholders are non-Bermudian. Major shareholders of BPL include Morgan Guaranty Trust Company, of Ohio; Charles Trippe of Massachusetts; Edward Trippe of Connecticut; and Basic, Inc of Virginia. Off the North Shore Road in Shelly Bay, midway between Flatt's Bridge and the Shelly Bay Plaza. Bus routes 10 and 11 to and from the Town of St. George and City of Hamilton stop here and offer a frequent service. It takes its name from Henry Shelly, one of Bermuda's earliest colonists of the early 1600s who lived here. The beach is public, popular, shallow and safe for the family, with limited access for the disabled and a disabled-only parking space for a car (not close to the beach). It has shade trees providing welcome relief. It also a popular place for residents to camp out over the Cup Match holidays. 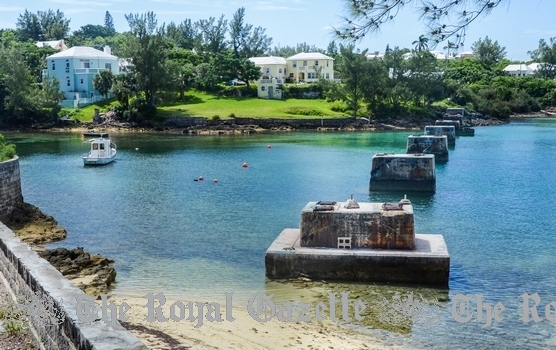 The seascape from the beach stretches to the Bermuda Royal Naval Dockyard in Sandy's Parish. On windy days, it's a favorite place for wind surfers (see smaller photo) to fly across the deeper water of the bay, out of range of swimmers. There are a children's playground and park with many indigenous species of trees and shrubs; and a playing field for several organized sports near a former horse racing track. There was a restaurant on the premises (see below). Visitors today can see at the adjacent sports field area of the complex, what used to be for many years until the late 1930s, the Shelly Bay horse racing track. In 1937, Oliver Caisey, Sr. (with his race horse Fanny) became the first black jockey at the Shelly Bay race track. His groom was Claude (Poker) Furbert. It was a particularly popular place for British Army officers stationed in both Devonshire at Fort Prospect and in St. Georges, as it was exactly midway between them. 2019. April 11. Plans for a small concession area in Shelly Bay Park will be unveiled at a meeting this evening. The Ministry of Public Works will also present plans for access for seniors and the disabled at the beach at the event, to be held at Francis Patton Primary School. A ministry spokeswoman said: “The ministry is keen to ensure that any proposed additions or enhancements to the Shelly Bay Park area receive public input.” Tonight’s meeting will be held in the school’s gymnasium with a start time of 6.30pm. A Bermuda Tourism Authority plan to install concession stands at Shelly Bay Beach has sparked opposition from some residents near the popular Hamilton Parish attraction. A group of residents staged a protest at the BTA bid to use shipping containers to house temporary concessions by the North Shore beach as part of its plan to boost the beach economy. The residents proposed an alternative, which included improved beach access for the elderly and the disabled. The pressure group also requested improved restrooms for the park and said they would not oppose a lunch wagon. 2018. August 9. Protesters against a plan to create family-friendly attractions at Shelly Bay Beach said yesterday that they feared the Bermuda Tourism Authority would push ahead with its plans despite local opposition. One of the organisers of a group created to fight the BTA proposal to set up temporary concessions in old shipping containers at the beach said a protest would take place tonight to clash with a BTA event. LaVerne Furbert, a trade union official, said: “I’m calling for as many people as possible who are opposed to what the BTA is proposing to come out and let their voice be heard.” Ms Furbert said that the group was prepared to thrash out an agreement on the future of the beach with the BTA. She added: “I do believe the BTA is looking to move forward with their vision regardless of how the people feel, which is unfortunate. I would have expected that there would have been an attempt by somebody in authority to get everybody in a room and see if we can reach a compromise that is satisfactory to all.” She was speaking as the BTA prepares to hold an event at Shelly Bay designed to showcase the concessions available under its plan to improve the island’s beaches. The event will include the four finalists in a tender process to operate at the beach — three food vendors, and a beach and boat rental business. The BTA unveiled its “Beach Economy Vision” plan for five beaches, including Shelly Bay, in June. Ms Furbert was one of five area residents who outlined an alternative vision for the beach at a press conference this week. The group’s proposal called for the beach to be made accessible to people with disabilities, including a removable non-slip mat for wheelchairs down to the water, rather than adding concessions. Ms Furbert said her group planned to present the BTA with a petition against its plan with more than 1,000 signatures. She added she did not think samples from vendors were needed. Ms Furbert explained: “I think that most people know what Ashley’s Lemonade tastes like. As far as the Smokin’ Barrel, I think most people know what that tastes like.” Ms Furbert said that the group was not opposed to a food vendor but it did not want one on the beach. She added the group was also against chair and umbrella rentals. Ms Furbert said that she had been contacted by three of the four possible vendors. She explained: “I had to let them know that it’s nothing personal. It’s just that we want the beach kept as it is, a family beach without commercialization.” Glenn Jones, director of strategy and corporate communication at the BTA, said yesterday: “The Bermuda Tourism Authority has long believed listening to public feedback makes our beach economy plan stronger. It’s the whole point for what’s planned on Thursday evening, and we look forward to seeing everyone there, so they can experience what’s proposed and give further input.” Mr Jones said earlier that the BTA would support moves to improve accessibility at Shelly Bay. He added: “Our architect tells us that the proposal for a beach-access mat can easily be incorporated into the existing plan. We’ll work with our colleagues at the Ministry of Public Works to see if we can get it done.” Ms Furbert said: “What the BTA is missing is that we still do not want any concessions — those repurposed containers — on the beach where they propose to put them. That won’t go with us.” The BTA meeting will take place from 6pm to 8pm. 2018. July 27. Residents near Shelly Bay beach at the centre of much-disputed development plans will have the opportunity to sample food and services that could be on offer. Lieutenant-Colonel David Burch told the House of Assembly today that the interview process with all applicants who responded to a request for proposals at Shelly Bay were completed this week. The Minister of Public Works said among the businesses were Ashley’s Lemonade and a start-up offering “an adventurous water experience”. They will be part of an event in August that will allow members of the public to learn more about what they could offer. Tape will also be used to trace out where temporary containers that could host the new facilities will sit. Protesters have said they are against the proposal to develop the beach area because it “is too small for any commercial activity”. Shelley Bay Race track in the old days (long since gone) when this was a hugely popular local racing event. Just east of Shelly Bay and Burch's Cove. Bus routes 10 and 11 drop you right outside the plaza. It has a do it yourself laundromat; full service grocery store; pizzeria; and clothing store. 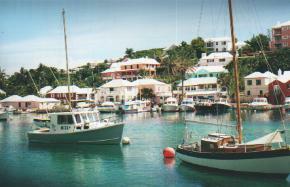 Budget for Bermuda prices, they stun many visitors. This local full service branch of The Marketplace grocery chain is open every day (Sunday from 1 pm to 6 pm). Phone 293-0966. Liquor cannot be bought in Bermuda on Sunday. Bailey's Bay, corner of Wilkinson Avenue and Harrington Sound Road. Address is 68 Harrington Sound Road. Telephone 293-8606 or fax 293-0087. A stop on the African Diaspora Heritage Trail. Built in the mid 19th century by free blacks including former slaves. Restaurant. See by name and Parish in Bermuda Cuisine. Also see an earlier reference to Moore in Blue Hole Hill Park and Walsingham Nature Reserve, above. A private trust property available for viewing for a charge to visitors and residents, owned by the Walsingham Trust. 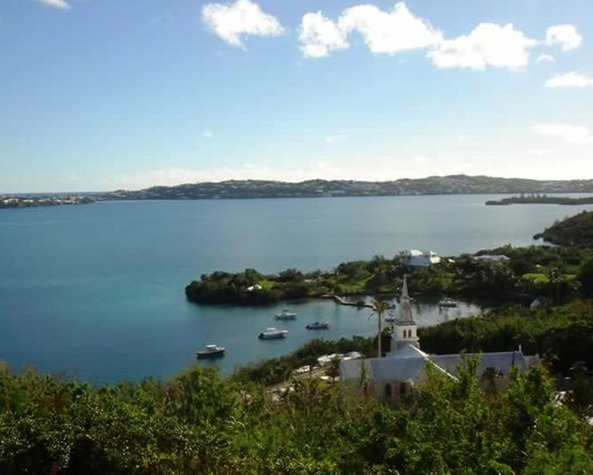 It is a charming, romantic, woodland area with beautiful views, worth a visit as one of the very few totally "unspoiled" places left in Bermuda. It demonstrates vividly how Bermuda once looked all over the main island before homes, hotels and other properties dotted and changed the landscape forever. Accessible via the Harrington Sound Road and by permission from both the Trust and the owner of the restaurant known as Tom Moore's Tavern (see below). Originally known as Walsingham House, once the property of Robert Walsingham, the coxswain of the doomed "Sea Venture" in 1609. Then it was the 17th century estate of Samuel Trott and his family. It was so impressive in British Bermudian colonial architecture that a replica of it was built at Wembley, London, for the Empire Exhibition of 1924. The house was a tavern for 75 years before it was restored and reopened as a restaurant with the "tavern" retained. It and the restaurant - See by name and Parish in Bermuda Cuisine - are named after the famous Irish born British poet Tom Moore (In Ireland always known as Thomas, never Tom), who arrived here in 1804 when he was 24 years old, before he became famous. He lived and worked as Registrar to the Court of the Vice Admiralty. The Town of St. George was then still the capital of Bermuda. He described the harbor of the town and parish as the "sweetest miniature of nature that can be imagined." He lived in rented premises on Old Maid's Lane and became notorious as the author of love poems to "Nea" - the 17 year old wife of William Tucker, Marshal of the Court of the Vice Admiralty. But he stayed less than four months. Bermuda and its remoteness were too tame. Later, he came to regret bitterly that he ever set foot in Bermuda. It was because the man who replaced him, or someone else in Bermuda, cheated the Admiralty but Moore was blamed and had to make good the losses. It aged him prematurely and affected his health. After he left Bermuda, he wrote splendid poetry later set to music, one of the most recognizable pieces being the "Last Rose of Summer." The calabash tree immortalized in his "Epistle V" still stands as a stump. 2017. Sunday, February 5. The Walsingham Trust and the Bermuda National Trust have lost their appeal against the Development Applications Board’s decision to allow the erection of gates at either end of their right of way to the Walsingham Reserve. Both organisations had hoped the Minister of the Environment, Cole Simons, would exercise his discretion in favour of the retention of free and open access to Tom Moore’s Jungle. A joint statement released this afternoon said: “This right of way — the Walsingham Trust’s only legal access to the reserve — has been made available to the public for 75 years, since the inception of the Trust in 1942. The application to install the gates was made by Bruno Fiocca, who seeks to improve the security of the Walsingham House property, more commonly known as Tom Moore’s Tavern. The right of way in question crosses Mr Fiocca’s property immediately beside the Tavern and has led to unauthorised public parking on his land.” The Planning Inspector’s report on the appeal, which was accepted by Mr Simons, made it clear that the DAB and the planning department could only rule on planning questions, and not on the legal question of what rights the Walsingham Trust had to allow the public to use its right of way. The Walsingham Trust is reviewing its position with regard to the legal issue. The statement continues: “Whilst the appellants objected to the erection of gates, we wish to acknowledge his long-term support of access to the reserve and his tolerance of the public use of his land for parking. The Walsingham Trust and Mr Fiocca have enjoyed a co-operative and mutually beneficial relationship for many years. Mr Fiocca has indicated a willingness to leave these gates open during the day. However, we must emphasise that any decision to allow public parking at this location is entirely at Mr Fiocca’s discretion and there is no guarantee that this will be the case in the future, in particular if the Tom Moore’s Tavern property changes ownership.” The Walsingham Trust has encouraged visitors to the reserve to access it via the Blue Hole entrance, where there is parking available. However, the public should be aware that this park is managed by the Parks Department, who ultimately control this access to the Reserve. This road connects Harrington Sound Road with the North Shore Road. If you access it after visiting the Leamington Caves and Tom Moore's Jungle be sure to note the several very big and beautiful stately homes on the right. Before the junction with the North Shore Road, see the entrance to the Crystal and Fantasy Caves. It was discovered in early 2002. American cave expert Dr. Tom Iliffe discovered and examined it in depth in May 2002 Bermuda's newest major find.